Snickers bars are no stranger to change. Over the years they have had almonds in addition to peanuts, dark chocolate instead of milk, and various combinations of all nougat and nuts, or all caramel and nuts. Now, we have a new treat to try. There are two big modifications to this bar: 1) a layer of peanut butter is added between the nougat and the caramel, and 2) it's not a "bar" at all, but rather two squares packaged together. The packaging makes the squares seem the same size as a regular Snickers bar, but they're a little smaller: 1.78 oz. and 250 calories, versus 2.07 oz. and 280 calories for the original bar. Each of the squares is about 1.25 inches across, and ¾ inch high. One of the most annoying things about candy bars—especially candy bars like Snickers that contain caramel or other messy ingredients—is that it's difficult to eat only a portion and cleanly save the rest for later. The two-piece format makes portion control much easier. The squares have a thin layer of nougat on the bottom, about 1/8 inch thick. A much thicker layer of peanut butter, about ¼ inch thick, is on top of that, and the peanuts are mixed into the peanut butter. A thin caramel layer is on top of the peanut butter, and the whole thing is encased in the familiar Mars-brand milk chocolate. Our biggest complaint was the texture. There is a lot of peanut butter, and when you combine it with the similarly-textured nougat, most of the bar ends up being the same slightly dry, slightly gritty texture. Since the caramel layer is so thin, that texture and flavor were entirely lost. 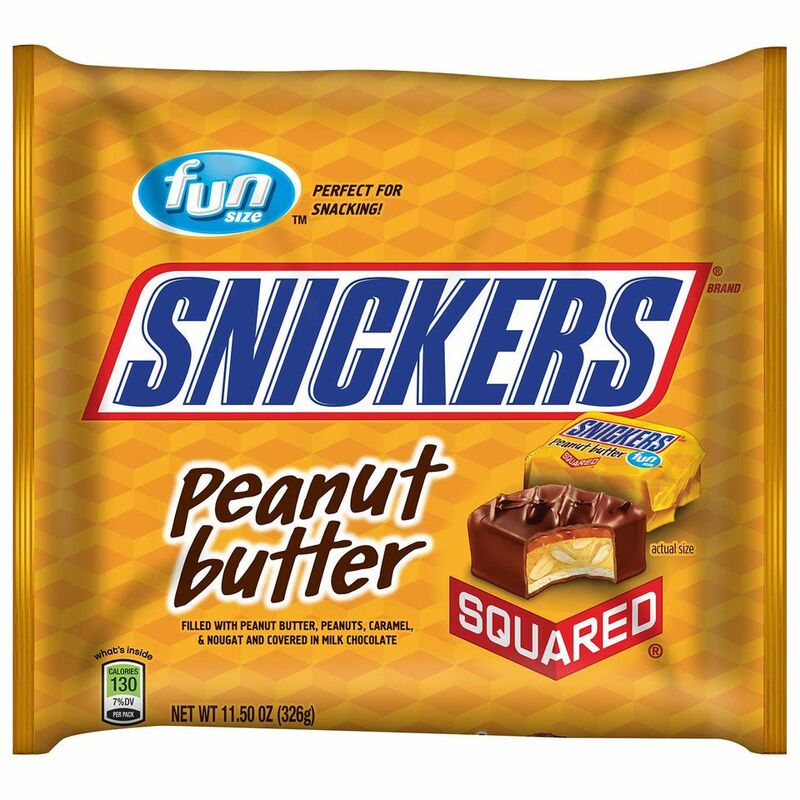 If you love the original Snickers, and if you like the crumbly peanut butter filling in a Reese's cup, you will like the Snickers Peanut Butter Squared.